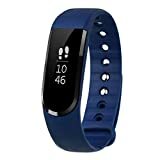 Sports Fitness Tracker: smart pedometer, calories record, sleep monitor, sync date and time, notifications, remote camera control, anti-lost alert, find Phone, sedentary alert, etc. Convenient Sleep Monitor: track your deep sleep and light sleep. LETSCOM smart bracelet gives you an indication of how much sleep you’re getting and how often you’re waking up in the night, offer you a best decent reading of whether you’re sleeping well. Responsive OLED Touch Screen – by tapping/sliding on the OLED touch screen, you can easily read the steps counting, calories, time, date, messages, etc. No Charging Cable Needed – LETSCOM fitness tracker can be removed off the strap and recharged from any 5V/1.0A USB power supply. High quality polymer rechargeable battery guarantees long battery life: about 7-10 days standby time/4 days operating time.